How to keep your lawn mower in tip top condition. If you already own or are ready to purchase a new lawn mower then you need to keep in mind that these are the kind of items that need to be taken are of and given regular maintenance in order to maintain its high quality of cut and to prolong the life-span of your mower - this is especially important if you've spent a lot of money on the product, you want value for your money, after all. So to keep things in tip-top condition you should be doing weekly, monthly and even yearly maintenance in order to keep your mower in optimal condition. A lot of this is very easy to do and takes literally a few extra minutes so don't worry about having to do anything too excessive. As the title suggests this maintenance should be carried out each week, however it could also be done bi-weekly for those with less time on their hands and depending on how many times you actually mow your lawn. After each session or as much as feasibly possible, you should use a hose to remove any excess dirt and clippings from the underside of the lawn mower (i.e. the part where the blades are). WARNING: Ensure that your lawn mower is disconnected from the power source if you own an electric powered lawn mower, however if you own one of the many petrol lawnmowers that are available then you should remove the spark-plug. 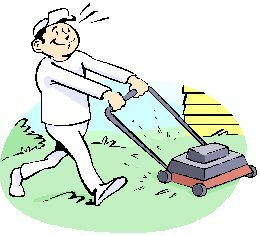 You also need to give the engine of the mower sufficient time to stop and also cool before you start the cleaning process. This type of maintenance is done to ensure that grass cuttings do not build up and also allows for enough room to allow the optimal mulching if your lawn mower has this option. Your lawn mower is only as effective as your blades are sharp so therefore you should ensure that your blades are sharpened once a month or bi-monthly to get the most out of your mower. It's a common problem that when cutting with dull blades it also makes your lawn look somewhat dull and will also cause your lawn to have an uneven cut - add the fact that it also promotes lawn diseases and more work for you, this is probably the most important maintenance out of all. 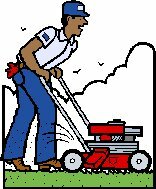 When cutting with a dull blade your mower is susceptible to using up to an amazing 20% extra fuel than during normal, optimal use, therefore not only does the above apply but you could also find yourself using much more fuel and therefore much more money if you operate a gas powered lawn mower. You can find extra information online for help with sharpening the blades of your mower however there are plenty of lawn mower servicing places in most areas if you would prefer someone else to take care of it for you. There are also lots of stores that sell new blades and they generally cost very little, so even once your blades have become somewhat dull, simply head over to a local store and get your hands on a new one for as little as $10. When reattaching the blade you must ensure that the sharp cutting edge of the blade is facing downward, towards the grass for obvious reasons. 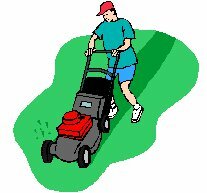 a) Each spring you should ensure that you change the oil in your lawn mower. For those who run a two-stroke engine then you should find that your oil is already mixed with the fuel therefore this step doesn't apply to you - you should check your engine to see which type of oil your engine runs before applying any. To drain any oil that may still be present before adding new oil, you should have a drainage plug located on the underside of the lawn mower, if you cannot find it please refer to your owners manual for the exact location. b) The spark plug should be replaced and they're relatively cheap, so there's not much extra cost addition here. c) If you have a filter for the fuel this should be replaced, however not all mower will have one. Again you should refer to the manual to find the exact location but in general you should find this somewhere on the fuel line between the tank and carburettor - it's often off-white or black in colour. d) Just like us humans your lawn mowers engine, the core of the product, needs to breath. As you will probably notice, when you're doing your lawn there are lots of dust and pieces of debris flying around and this often gets caught p in the air filter - to ensure optimum performance and cleanliness this should be replaced twice a year. That is it. You should now be running a perfectly working lawn mower which should last for many years to come.